Especially now that I’ve discovered this pasta recipe. I can’t imagine how insanely good this will be with fresh roasted red peppers and onions from my farmer’s market. This pasta has earned a spot on my permanent rotations list, and that’s quite a feat considering how much I love to try new recipes. And while we’re dreaming of things like farmer’s markets, can we please all move to Italy? 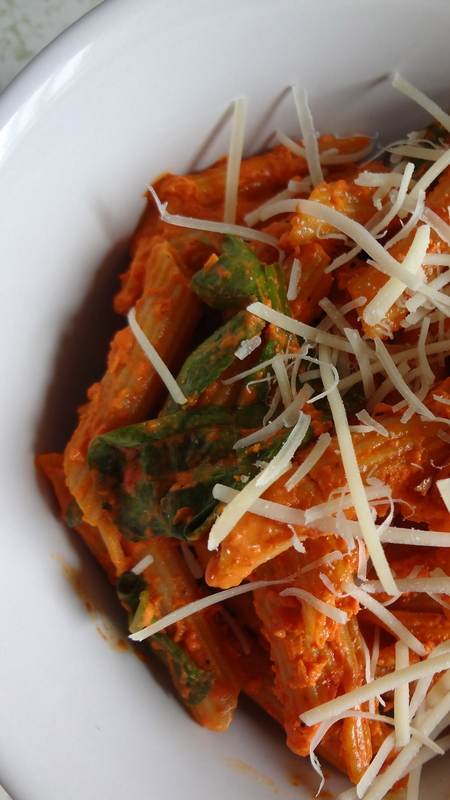 Warm sunshine, pasta galore, and scenic views sound like all you really need in life. 1. Bring a large pot of water to a rolling boil and salt generously. 2. While the water is heating, warm the olive oil in a large frying pan or saute pan over medium heat. Stir in the onion and saute for 7 to 8 minutes, or until softened and translucent. 3. Add the peppers and 1/2 teaspoon salt and cook, stirring, for 2 to 3 minutes, or until they are heated through. Raise the heat to medium-high and stir in the vinegar. Cook for 1 to 2 minutes, or until the vinegar has been absorbed. Remove from heat and let cool for 5 minutes. 4. Transfer the contents of the frying pan to a blender and puree until smooth. Return the puree to the pan and place over low heat. 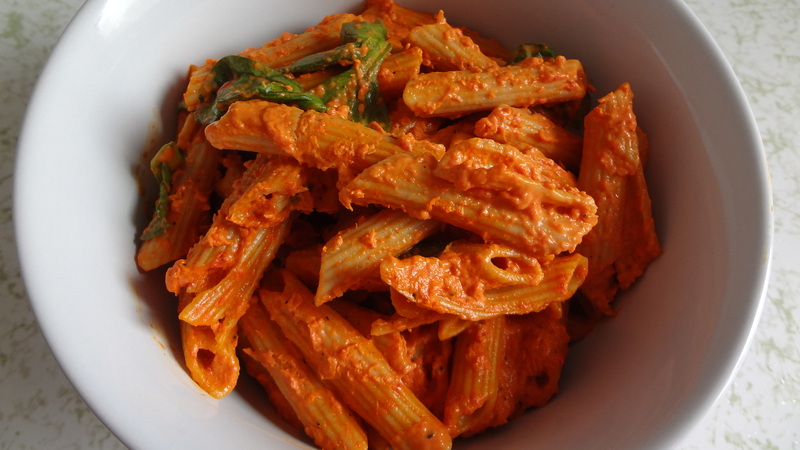 In a small bowl, whisk together the tomato paste/puree and cream. Whisk this mixture into the sauce. Cook, stirring, until the sauce is nicely thickened and hot. Taste and add additional salt if necessary. Turn off the heat and cover to keep warm. 5. Add the pasta to the boiling water, stir to separate, and cook according to the manufacturer’s instructions until al dente. Drain the pasta in a colander set in the sink, and add it back tot he pasta pan. 6. Gently toss the pasta and sauce in the pasta pan, and stir in the 4 cups of spinach, letting it wilt slightly. Stir in half the Parmagiano and toss again. Transfer the dressed pasta to individual bowls and sprinkle with the remaining cheese. Serve immediately.